Biking is quickly becoming the choice of transportation in exploring and getting around Anna Maria Island. Cyclist on Anna Maria Island can enjoy the breath taking views from the picturesque ride along the key's stretch of beaches and coastal habitat on a number of paved paths and designated bikes routes. Bike riding is the perfect way to enjoy the island on “island time.” Anna Maria has so many unique and charming areas to explore and the best way to do it is on bike so you don't miss anything! 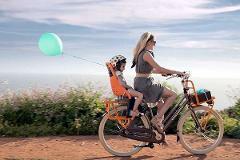 Step out of your routine of rushing around in the car and hop on a bike and enjoy the ride. Given that the whole island is bike friendly it provides limitless exploration to the many places to visit and see on the island. You can bike to restaurants, the beach, shops, the grocery store, ice cream shop and much more! Rental includes helmet.